You are here: Home / A “must ride” road. As much as I love the north coast, I am continually on the lookout for ways of getting there and back that avoid having to use the Pacific Highway. If there is a more boring and frustrating road in Australia than the main northern route, I am yet to find it. And, as more and more of the remaining interesting parts are either buried under concrete flat-top or bypassed into oblivion, seeking out the alternatives becomes more and more of a challenge. Happily, I am old enough to remember when the town of Buladelah was ON the highway rather than being by-passed by it and so I am also able to seek out and enjoy a wonderful part of the old road that is now substantially unused. It is now simply known as the Wooton Road (no, I don’t think Ken has anything to do with it). It travels north from Buladelah, across a mountain range, drops down through some beautiful farming country and rejoins the Pacific further north. And it’s the squiggly bit in the middle that is really interesting. It is called O’Halloran’s Gap and it used to be one of the most dangerous and over-policed pieces of the highway between Newcastle and Taree. 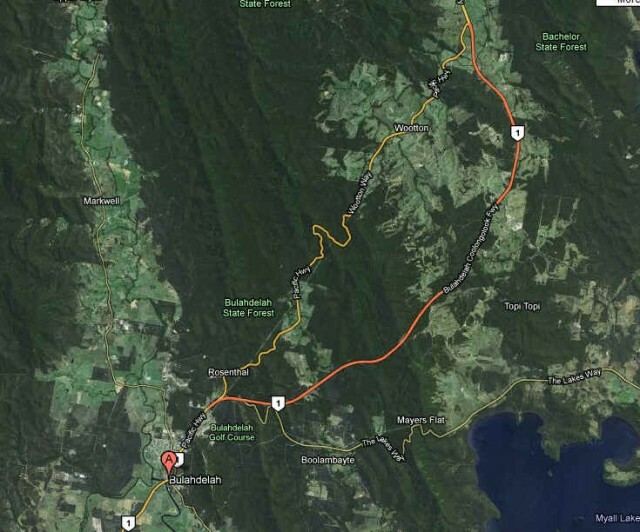 The mountain pass is a bit like Macquarie Pass except that it both climbs and falls as you head north (or south). Towards the end of its life as part of the highway it was equipped with 2 speed cameras to try and slow people down. Thankfully, now that it is just a minor country road, the speed cameras have been removed. These days the road is substantially deserted and rewards the rider with a glorious switchback of road that challenges the skill and rewards the effort. The surface is still reasonable (though degrading due to decreased maintenance) and the only issue of any note is that it is often covered with substantial amounts of leaves and litter from the trees that surround it. However, as long as it’s dry, the leaves do not present a problem. Should you find yourself in the vicinity, reward yourself with a spirited run on the Wooton Road. You won’t be disappointed, and you WILL go back again. Also I remember it as being O’Sullivans Gap. When did it change or am I incorrect or typo? I’ve seen it go from not a very nice to a very nice road after years of improvements, more overtaking and best, smooth tar and then they bypassed it. Always gave it respect and one night heading south and down in torrential rain almost lost it, so lucky. I actually haven’t been that way since they bypassed it! I rode it again recently, actually, still a great road. I don’t recall it being called anything but O’Halloran’s Gap but it could have been. Glad you’re enjoying the articles, thanks fr the feedback.